I have no real idea how the Good Lord feels about it, since He seemed to be rather inclined against any kind of idolatry or appearance of it in older scripture. Whether He approves or not, there it is. My neighbor, BCJ. So I have determined that I will love my neighbor as myself. Truth is, BCJ is a good reminder. The last couple of days have been alternating soupy-foggy and stormy-drenchy and even at mid-day or at mid-night with the spotlights of the Great Passion Play campus shining on him, or early in the morning while I was walking Roadie before the sun didn’t seem to rise and shine, BCJ has been hard to see. Just as in my life — and I’m guessing, yours — Jesus is sometimes hard to see. We look at the mess our world is in and we wonder why He’s so hard to see. Before that, it might have been the Kennedy assassination, or a World War, or the Civil War, or the Revolutionary War, and people were asking the same question. Generations before and since, people in ours and other nations have been wondering the same thing when sin and evil and hatred and death haunted their loved ones — have been asking where He is. And, just like BCJ on my morning walks, Jesus was where He has been all along. Jesus is right where we left Him in the story of scripture, since He physically left this world the last time. At the Father’s right hand. In heaven. In charge. Doesn’t He see what’s happening down here? Doesn’t He hear our cries and prayers? Doesn’t He know we’re hurting, starving, fighting, dying? He was here, remember? Lived here. Taught here. Healed here. Loved here. Lost loved ones here. Lived again, here, in this world; only to rise to a better one to make a better place for us. If He’s hard to see, it’s not because He’s moved. It may be because we have. Or the clouds that obscure Him have. Or the lights have failed and the darkness has, for a time, won out. I moved 800 miles recently — not so much to be closer to BCJ, but to my kids — and I doubt that I’ll be moving any closer to the statue on East Mountain. Still there, rejoicing with those who rejoice. Still there, mourning with those who mourn. Still there, interceding for those who pray. Still there, providing and remaining and answering the door for those who ask, seek and knock. I know I need to remember that. Maybe you do, too. 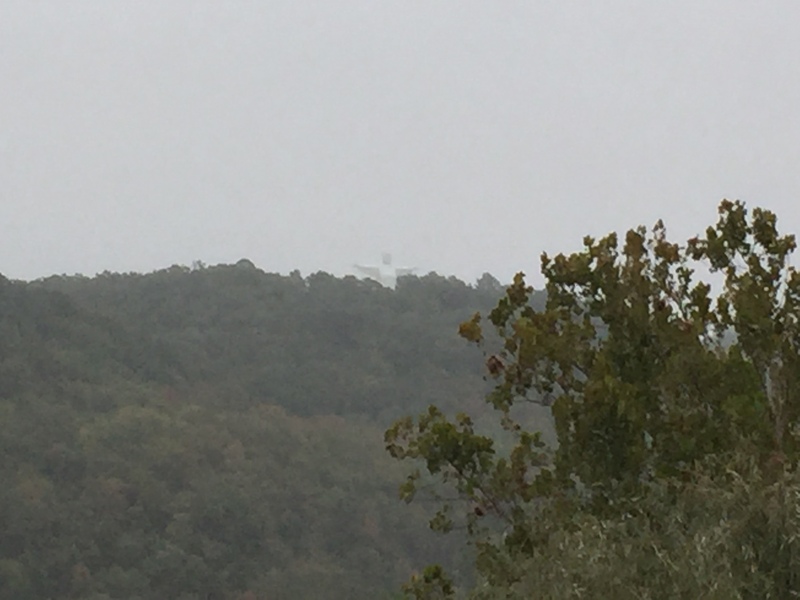 Well, that’s the way I see things from Eureka Springs, Arkansas — where the fog creeps in on little cat’s feet and beats a retreat when a storm is the norm. And where BCJ says hey. Hey kb, I see we are almost neighbors, an hour and a half away. Might look you up next time I’m at the Springs.